Magnetic resonance imaging or MRI in short is an imaging technique used primarily in medical diagnostics for the representation of the structure and function of tissues and organs is used in the body. It is based on the physical principles of nuclear magnetic resonance (NMR), and is therefore referred to as magnetic resonance imaging (colloquially shortened as MRI). Sometimes tomography is used to replace the last two words of Magnetic resonance imaging. Resonance Imaging is equivalent to Tomography. We will discuss more about the technical part of Magnetic resonance imaging rather than medical part. Magnetic Resonance Imaging can be used to get cross-sectional images of a living body, which allow an assessment of the physiology and pathologic of an organ. 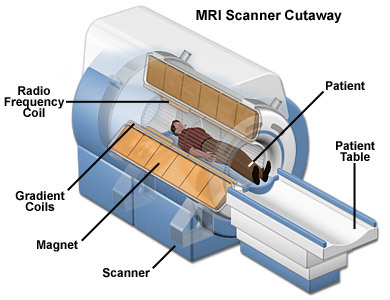 Magnetic resonance imaging is based on very strong magnetic fields and electromagnetic alternating fields in the radio frequency with which certain atomic nuclei (usually hydrogen nuclei / protons) in the body, which can be resonantly excited, then the receiver circuit in the electrical signals collects it as data. The Magnetic Resonance Imaging device is not harmful like X-rays or other machines where ionizing radiation is used. An essential basis for the image contrast in Magnetic Resonance Imaging are different release times of different tissue type. Also see the different content of hydrogen atoms contributes to different tissues (eg, muscle, bone). The method of Magnetic Resonance Imaging is based on the atomic nuclei in the tissue studied specifically (synchronous and resonant ) are excited electromagnetically and then to return to their ground state give a signal. Some atomic nuclei (such as the hydrogen nuclei ) in the molecules of the tissue to be examined have an intrinsic angular momentum ( nuclear spin ) and are therefore magnetic. This understanding is the basis of Magnetic Resonance Imaging. These produces paramagmnetism after applying a strong static magnetic field, a measurable magnetization in the direction of the static field. By an additional high-frequency alternating field in the radio frequency range can be deflected from the direction of this magnetization of the static field (tilt). As a result of deflection of the magnetization starts at the field direction of the static magnetic field to precess, that is it rotates the magnetization direction. This precession movement of the tissue on the magnetization can induced can be measures a voltage. After switching off the high-frequency alternating field decreases the transverse magnetization, the spins align themselves so again gets in parallel to the static magnetic field. For this so-called relaxation they need a characteristic decay time. This is dependent on the chemical compound and the molecular environment. For better understanding of Magnetic Resonance Imaging, the principle of the simplest, so-called spin echo sequence is outlined briefly in 1950 by Erwin Hahn. We are describing a typical Magnetic Resonance Imaging Device. Sun Microsystems Solaris Operating System is frequently used as the Operating System Layer. Usually Proprietary software is used in a Magnetic Resonance Imaging for patient data input and management software as well as the core software which analyzes the input data. All modern Magnetic Resonance Imaging device supports HP’s DICOM imaging format. As a computer is basically used in Magnetic Resonance Imaging and a software layer analyzes the data the chance of data fabrication is more. This Article Has Been Shared 2883 Times! Cite this article as: Abhishek Ghosh, "Magnetic Resonance Imaging or MRI," in The Customize Windows, April 25, 2012, April 18, 2019, https://thecustomizewindows.com/2012/04/magnetic-resonance-imaging-or-mri/.